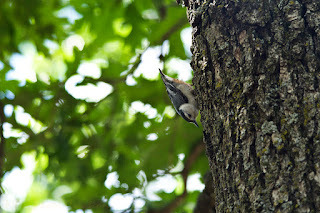 While I was in Minnesota, I was finally able to capture a Nuthatch! I was steaming up the large scale locomotive that I help run one morning and saw this guy walking down the tree. I hurried and grabbed my camera and got off a few shots. I got mad at myself when I realized a couple in that I had not zoomed in as much as I could in my haste so this is not as close as it could have been or that I would have liked. I still like the image and wanted to share it though as it shows how they walk down tree trunks looking for food. Cute little birds.